Finally I have done this again! 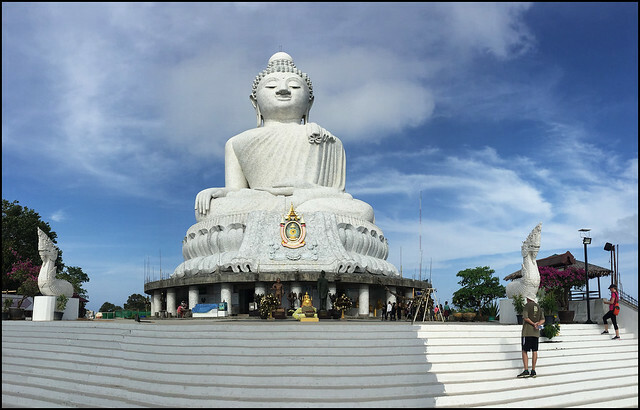 It was back in 2010 that I hiked up to the Phuket Big Buddha from Karon. A hike from nearly sea level up to nearly 400m above sea level. You can find the old blog post here. And since then I have always had the intention to do the hike again, but never found the right time, or just been too lazy. 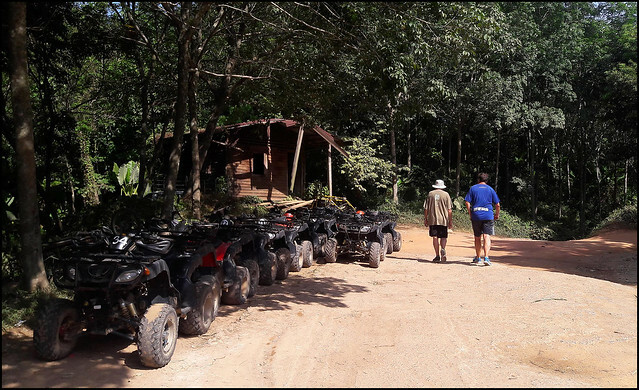 That blog page from 2010 is actually one of the most visited on Jamie's Phuket, and many people have asked me about doing the hike. 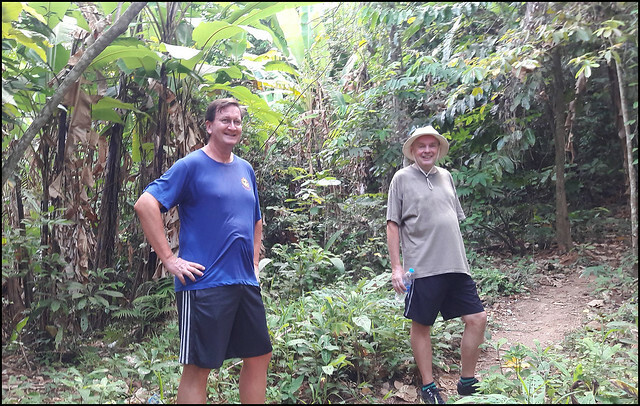 I often point them in the direction of Steve at the Pineapple Guesthouse in Karon, because he has done the hike again since 2010! Recently Steve told me that the path is now much better, well marked with signs and so I figured it would be time to hike again. 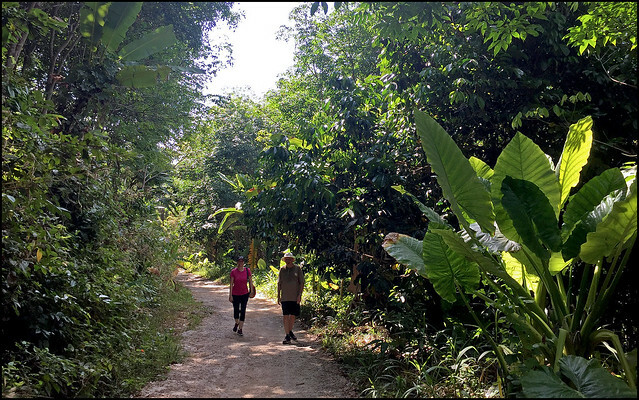 Start time was set for 7:30am on Sunday 25th March 2018 and I was joined by Steve, and Lana who is also a long time Phuket resident and runs the GoPhuket website. It was a beautiful high season morning - an early start is absolutely recommended if you don't want to suffer from heat exhaustion on the climb! The start of the hike is easy. You just cross the road from Pineapple and walk up Patak Soi 14 next to Ice Family Tour. The first kilometer is on this road. Not a busy road. There are a few houses up here, some nice little places for rent and local houses. Easy to follow, not very steep, reaching about 100m above sea level when the road splits. And there is an obvious sign pointing the way. 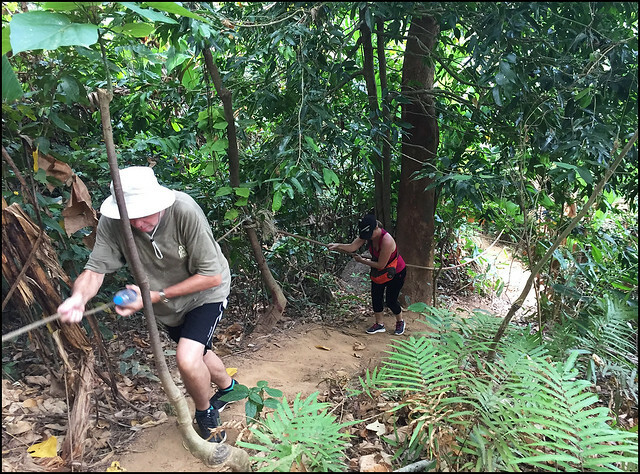 So, there have been busy hands at work in Karon recently making this hike easier to follow. You can actually take the left or right road. I was following Steve's advice as he'd done the hike just the week before. We turned right, which leads to a steep path. The left route is longer, but not so steep and we planned to come down that way. (above) I'd suggest turning right at this point. Only another 1.5km? Sounds easy! It gets steeper! After the right turn you need to keep left and a side road heads more steeply uphill less than 100m after the first right turn. And then a dirt track turns left again and things get steep. I'd carry some water with you, but you can buy water at the Buddha anyway. 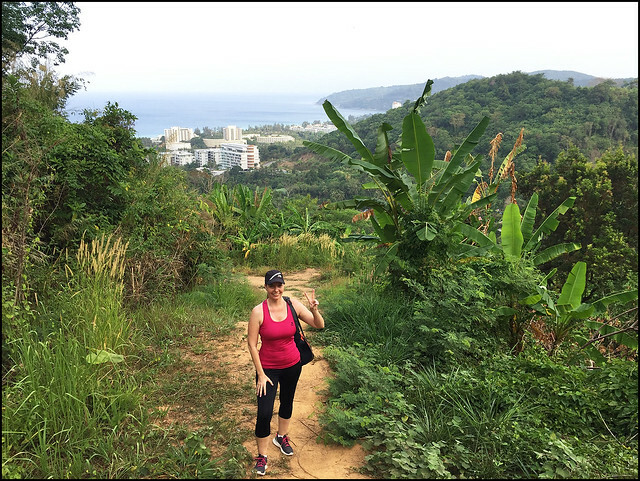 This hike is not super hard, but you will need to be reasonably fit. (above) Start of the dirt track. Things start to climb pretty quickly. After less than 10 minutes we reached a point where the jungle opened up and we got some views back towards Karon beach. (above) Lana and the view after about 25 minutes walk. It's very green up here in the hills. You can see there are condominium developments further down the hill, but nothing once you get above 100m above sea level. I was sweating already, but the really steep walking was just about to start! In the next half kilometer we gained about 150m in altitude and it took about 20 minutes. The steepest sections have ropes to help you. And the ropes were needed! This new path is easy enough to follow, but it's not an easy hike! (above) On the steep section of the hike up to the Big Buddha. This was hard work for a little while. I'd not want to try in wet weather and was glad I did not wear my usual footwear (flip flops!) - running shoes or walking boots best although something like a decent pair of Teva sandals might be OK.
(above) Me and Steve on the way up. Several short breathers were needed. I mean, I am not too unfit these days and was not huffing and puffing too much, but it was very sweaty work! Finally things flattened off a bit for a couple of hundred meters before the path came out onto the normal road up to the Big Buddha, which starts in Chalong. You could also simply hike up the road, but where's the fun in that! 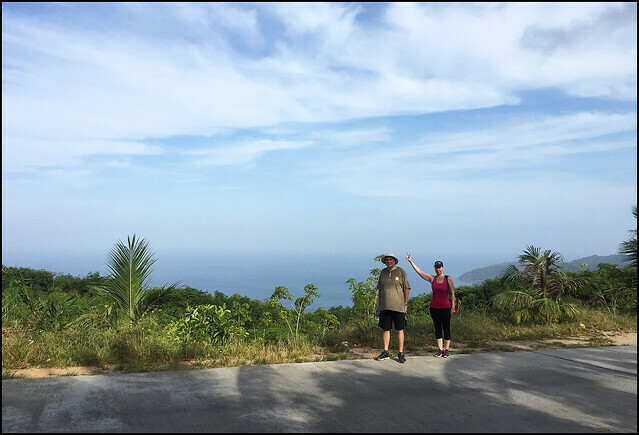 From the upper reaches of the road you get views across the sea with Karon beach way down below. 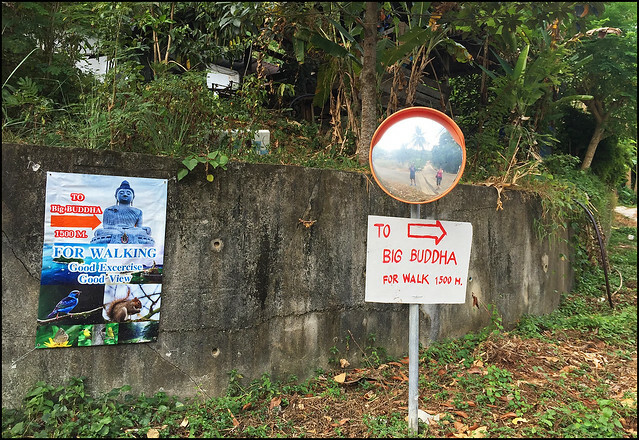 (above) Easy walking for the last half kilometer along the road to the Big Buddha. 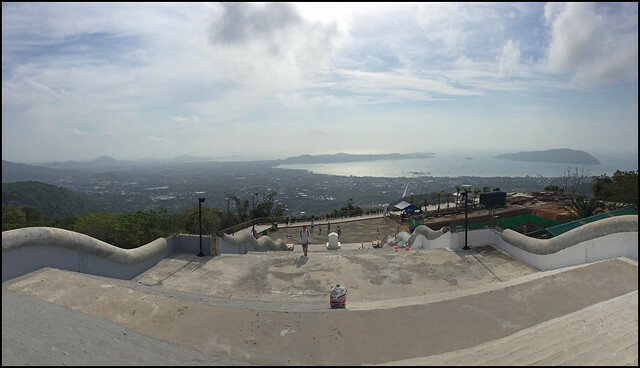 (above) The Big Buddha and the view east over Chalong Bay. Steve, Lana and I have of course all visited the Big Buddha many times before, but we took a walk around for some photos and to enjoy the breeze which helped dry my sweat a bit! Nice to visit the Buddha early in the day when it's not so crowded and not so hot! 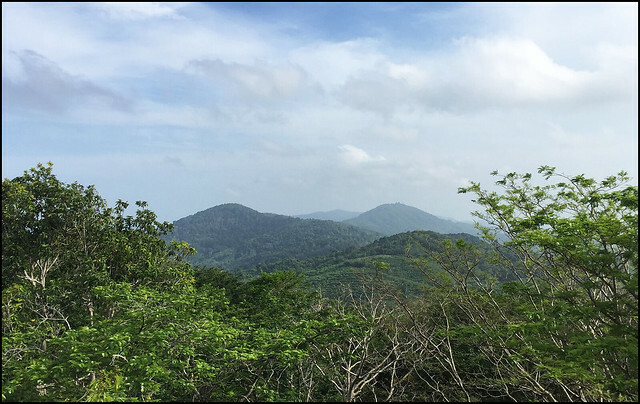 (above) I have always loved the view north across the hills, along the "spine of Phuket". Up in the hills, Phuket is still so green. The name "Phuket" comes from the Malay word Bukit, which means hill. 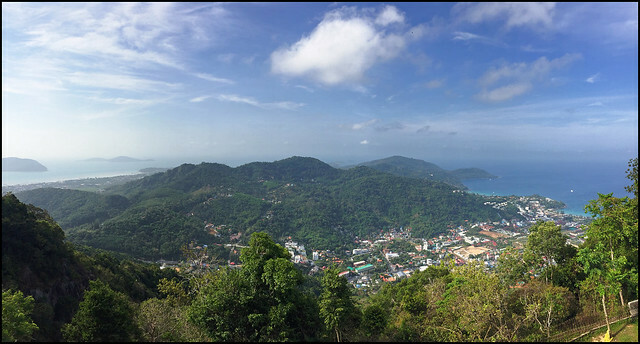 The view south (above) is also pretty great - you can see right down to the tip of Phuket at Phromthep Cape. More green hills. 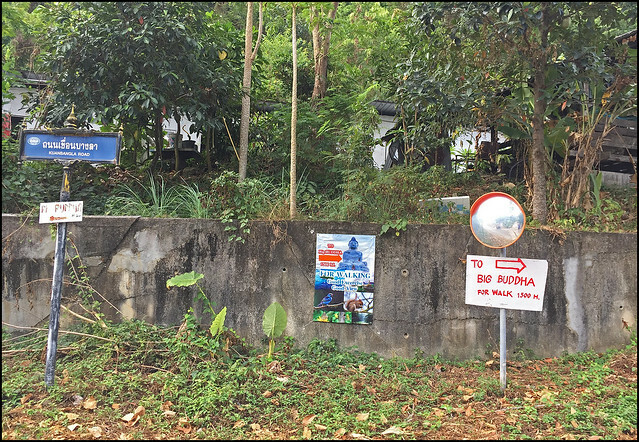 The developed area on the right side of the picture is along the back road behind Kata beach and heading towards Chalong. To the left is Chalong Bay heading down towards Rawai. And then - time to walk back down again ... back down the road, but passing the steep path where we'd come up. The steeper sections of that would probably see me going down on my backside! 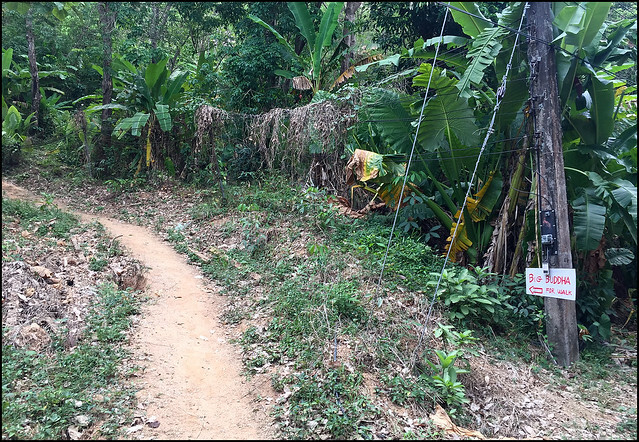 If you walk further there's an elephant riding place / ATV place on the left and the path is signposted back to Kata / Karon. (above) Me and Steve at the start of the path down again. There was plenty of easy walking, though the distance is further than the steep path on the way up. (above) Lana and Steve on a nice easy path on the way down. There are some steeper sections going down, especially one part with a slippery dirt path, but it's mostly easy going. I would add a couple more photos, but .. my phone battery died - I was taking photos, plus running 2 different apps to track the path (Strava and MapMyWalk) - I think having both of these using GPS plus all the photos drained the battery. I wanted to map the paths up and down. So it looks like I need to do this hike again very soon! For now, you can find the map of the upward path on both Strava and MapMyWalk. 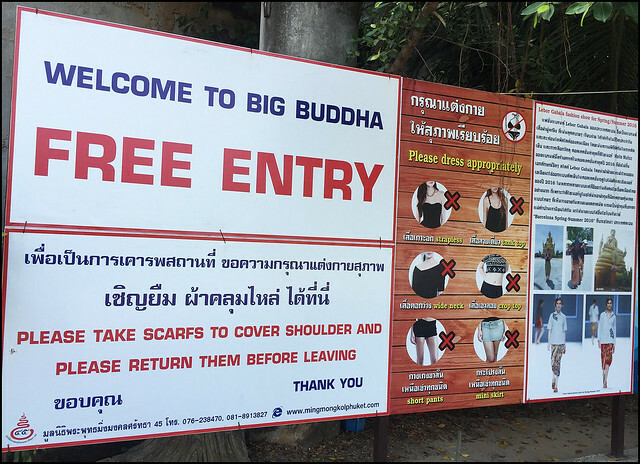 For some good exercise, great views and to avoid paying a taxi I recommend hiking up to the Big Buddha! You can download a .gpx file here - this can be imported into Google Earth (click on File > Import .. then choose the file you downloaded and make sure the file selection is set to "all files". Then you can see the path to the Big Buddha in Google Earth).